- For Italian double ring BB spindles, add 1 mm to BSC/French lengths. Record ("NR") and SR all use the same arms at any given time in history. 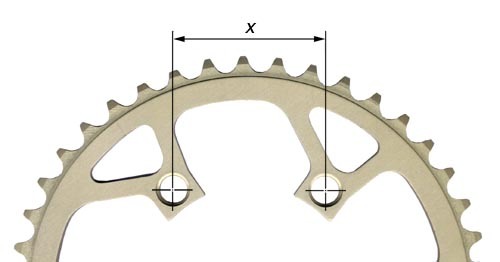 An SR crankset only has different chainrings than Record. Otherwise, they are identical. BBs are not!! There are four types: GS, Record, Nuovo Record, and Super Record (Ti spindle, Alu cups). - Use of pre-78 cranks on post-77 spindles will result in cranks sitting 1.5 millimeters too far outboard. 26.0 mm Italian Standard for drop bars. 128mm 6sp, 7sp, 8sp Transition Spacing, not an offical standard. Some bikes were built with a spacing of 128mm to accept either 126 or 130mm wheels. A steel bicycle frame can be cold set from a smaller spacing to a wider one by one of several different methods. Usually it is only advisable to go from 120 to 126 or 126 to 130mm. Spreading the dropouts too far can cause damage to the frame in the form of breaking bonds at the brake bridge or similar problems. See the Glossary term Cold Setting for details on how to cold set a bicycle frame. Note: You Should Never attempt to cold set frames made of aluminum, carbon fiber or 753 steel.